Due to the large latitudinal range of the country and its varied topography and climate, Norway has more different types of habitats than almost any other European country. There are approximately 60,000 species of different life forms in Norway and in the adjacent waters (excluding bacteria and virus). There are 2,800 species of vascular plants, 450 bird species (250 species nesting in Norway), and 90 mammal species. About 40,000 of these species have been described by scientists. The Red List of 2006 includes 3,886 species. 17 species are mainly listed because they are endangered on a global scale, such as the European Beaver, even if the population in Norway is not considered as endangered. There are 430 fungus species on the Red List, many of these are found in small remaining areas of old-growth forests. There are also 90 birds species on the list and 25 mammals species. 285 species are listed as critically endangered (CR) in Norway, some of which are: gray wolf, arctic fox (healthy population on Svalbard) and pool frog. The largest land predator is polar bear, the largest predator on the Norwegian mainland is brown bear, whereas the largest herbivore is common moose. In Norway some of the most exceptional species in Europe still exist: muskox, wild reindeer, white-tailed sea eagle and killer whales. Natural vegetation in Norway varies considerably, as it is expected in a country with a large latitudinal range. There are generally fewer tree species in Norway than in areas in western North America with a similar climate. That is because the migration routes after the ice age were more difficult in the north - south direction in Europe. Many introduced plants have been able to ripen seeds and spread, whereas less than half of the 2,630 plant species in Norway today are considered native. About 210 plant species growing in Norway are listed as endangered, and 13 species are endemic. National parks in Norway are mostly located in mountain areas, and only about 1.7 % of the productive forests in the country are protected. Some plants are classified as western due to their need for high humidity and low tolerance to winter frost. These are found close to the south-western coast, with the northern border near Ålesund; some examples are holly and bell heather. The mild temperatures along the coast allow for some surprises; some hardy species of palm grow even as far north as Sunnmøre, one of the largest remaining Linden forest in Europe grows at Flostranda in Stryn and planted deciduous trees such as horse chestnut and beech thrive north of the Arctic circle (as in Steigen). Plants classified as eastern need comparatively more summer light, less humidity, and they tolerate cold winters; these are often found in the southeast and inland areas. Some examples are: Daphne mezereum, Fragaria viridis and spiked speedwell. 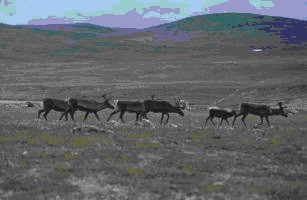 Some eastern species common in Siberia grow in the river valleys of eastern Finnmark. There are also species which seem to be in-between these extremes, such as the southern plants, for which both winter and summer climate is important (pedunculate oak, European ash and dog's mercury). Other plants depend on the type of bedrock. 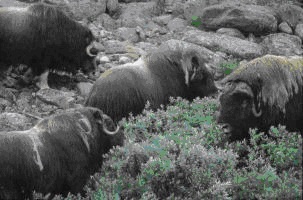 There is a considerable number of alpine species in the mountains in Norway. These species do not tolerate long and warm summers and cannot compete with plants which have adapted to a longer and warmer growing season. Many alpine plants are common in the North Boreal zone and some in the Middle Boreal zone, but their main area of distribution is on the alpine tundra in the Scandinavian mountains and on the Arctic tundra. Many of the hardiest species have adapted by using more than one summer to ripen seeds. Examples of alpine species are glacier buttercup, Draba lactea and Salix herbacea. Some alpine species have a wider distribution and also grow in Siberia, such as the Rhododendron lapponicum (Lapland rosebay). Other alpine species are common in the whole Arctic whereas some grow only in Europe, such as globe-flower.